Shopping for a new Ford Explorer? 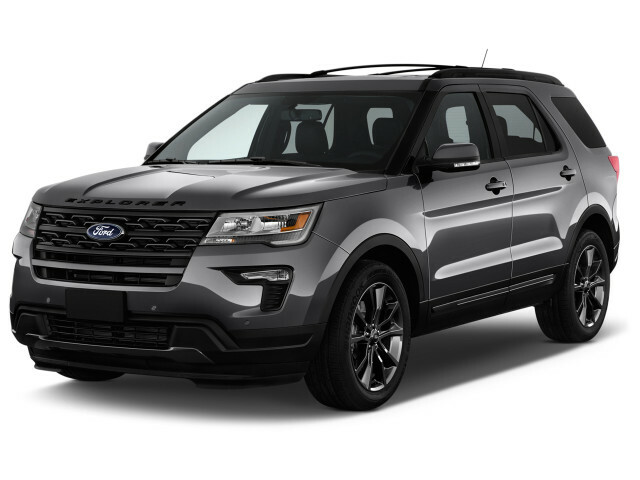 A 2019 Ford Explorer XLT with all the active safety boxes checked is our choice. The 2019 Ford Explorer tackles family life well. The popular Explorer makes its way onto just about every three-row crossover SUV shopping list, and with good reason. It’s roomy, rides well, and offers some standout features. Yet the 2019 Explorer’s basic design is showing its age, now nearly a decade into its life cycle. A new 2020 Explorer has great promise, with a new platform and a coming plug-in hybrid model; it's put the 2019 model on the shelf and it isn't even on sale yet. For 2019, the Explorer lineup gains a few new trim packages, active safety tech is more widely available, and a power tailgate is newly standard on the popular XLT trim level. The Explorer is available in base, XLT, Limited, Sport, and Platinum trim levels. Most Explorers leave the automaker’s Kentucky assembly plant with a 3.5-liter V-6 rated at 290 horsepower underhood. A turbo-4 that provides more thrills is an option on most trims, while a twin-turbo V-6 rated at 365 hp turns the Explorer Sport and Platinum trims into entertaining crossover SUVs. Front-wheel drive is standard and all-wheel drive is optional on most trims, but don’t look to explore too far. The Explorer is more of a tall minivan than a real off-roader. That theme should be clear the first time you see one. 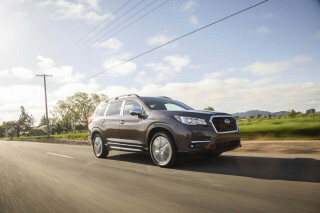 This low-riding crossover SUV is devoid of the fender-flared, two-toned look it once wore. The Explorer seems older inside, where shorter drivers can have difficulty finding a good seating position among the SUV's beefy roof pillars and high belt line. Row two’s seats aren’t very comfortable, and the third row is best for kids. Cargo space is decent, especially with the third row stowed away. Our main concern with the Explorer is its lackluster safety record, something that’s hard to overlook in a vehicle meant for family hauling. The IIHS found eyebrow-raising results in some crash tests and all rivals now at least offer automatic emergency braking. The 2019 Ford Explorer’s familiar face has aged well. Outside, the Explorer’s shape is clean and largely unadorned. Unlike Eddie Bauers of decades past, the current model doesn’t try to be faux rugged. It’s modern enough and smart in certain lighter shades with larger wheels. Thankfully, Ford now includes alloy wheels as standard equipment on all versions of the Explorer, as well as tinted windows. Explorer Sports feature black grilles that make them look rather too much like the Explorer-based Ford Interceptor police vehicle. Hey, if that’s your thing—just stay out of our rearview mirror. Explorer Platinums add LED lights and distinctive wheels that help them look like the $55,000 that Ford charges. The Explorer’s interior avoids the busy look seen in many other Ford products. The 4.2-inch screen on base models doesn’t do it any favors, but the optional 8.0-inch touchscreen integrates well with its surroundings. Earlier Explorers used frustrating capacitive switches, but those have disappeared in favor of much more functional traditional buttons for audio and climate functions. Base Explorers look a little drab with their simple cloth upholstery and plain trim, but the synthetic wood trim and dressier stitching in Limited and higher Explorers is more convincing. 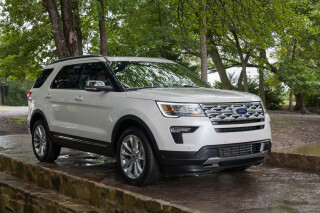 The 2019 Ford Explorer rides well and has ample power from its available turbo engines. As long as your definition of exploring involves strip malls and paved highways, the 2019 Ford Explorer makes a willing companion. Its trio of engine choices all work well and it has a comfortable, composed ride. 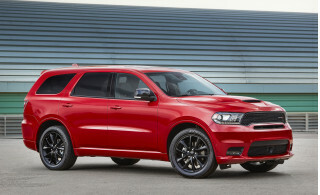 Standard fare on base and XLT Explorer trims is a 3.5-liter V-6 rated at 290 horsepower and 255 pound-feet of torque. The base engine provides adequate go in most situations, but can feel winded climbing grades. A better choice is the optional 2.3-liter turbo-4 with its 280 hp outshined by 310 pound-feet of torque. Explorer Sport and Platinum trims use a 3.5-liter twin-turbo V-6 rated at 365 hp and 350 pound-feet for maximum power and maximum thirst. So-equipped Explorers average just 18 mpg combined. Regardless of engine, all Explorers use a 6-speed automatic transmission. Front-wheel drive is standard and all-wheel drive is optional —except with the twin-turbo V-6, where it’s mandatory. The Explorer rides smoothly and takes big bumps in stride, even with the larger 20-inch wheels on many models. Explorer Sports have special suspension settings that are firmer, but not unduly so. No Explorer hides its mass that well on a curvy road, but they feature accurate, direct steering and less body lean than some crossover competitors. 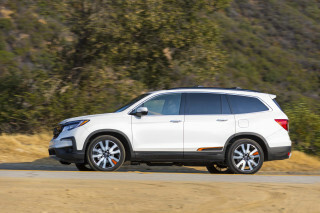 The Explorer Sport tips the scales at nearly 5,000 pounds before passengers are added to the equation and there’s only so much suspension tweaking that can cancel that out. Even with the multi-mode traction control system on all-wheel-drive models, the Explorer isn’t an adventuremobile. It sits low to the ground and its tires feature tame, street-oriented treads. With the turbo engines, the Explorer can confidently tow smaller trailers. 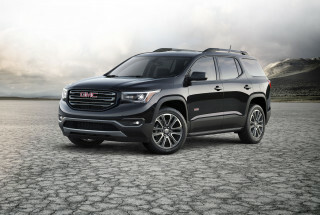 The 2.3-liter is rated to tow 3,000 pounds, while the twin-turbo V-6 on Sport and Platinum trims can tow 5,000 pounds. The 2019 Ford Explorer’s interior doesn’t prioritize passenger comfort like it should. Up front, the Explorer features a standard 8-way power driver’s seat. Higher-spec trims add power adjustment for the passenger’s seat, too. The standard cloth upholstery feels hard-wearing but not particularly plush and the optional leather isn’t much dressier until you step up to the pricey Explorer Platinum with its higher-grade hides. Massaging front seats are optional on Limited and above trims, too. Unfortunately, the Explorer’s second row doesn’t live up to the front. It’s spacious enough, but the standard bench is thinly padded. The optional second-row captain’s chairs are a smart, and popular, bet, but they’re not that much more comfortable. Row three is best for kids and it’s not especially easy to access. With the second and third rows folded flat, the Explorer’s cargo bay opens to haul about 73 cubic feet of gear. That drops to a still-reasonable 39.2 cubes with the second row upright. Behind the third row, the Explorer can still haul 21 cubic feet. Explorers we’ve driven have had a solid feel with interior materials that feel price-appropriate. At about $55,000, the Explorer Platinum is priced on top of some luxury-brand crossover SUVs, but its softer leather and stitched dashboard trim can hold their own. Disconcerting crash test results make the 2019 Ford Explorer a tough sell for its safety. 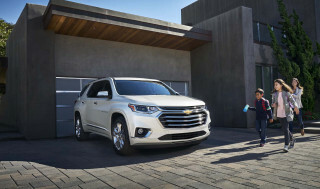 The 2019 Ford Explorer falls behind the competition when it comes to safety, something that should be high on the priority list for most crossover SUV shoppers. All Explorers include seven airbags as standard. Airbags integrated into the second row’s seatbelts are optional. The range-topping Explorer comes standard with a system that pre-charges the brakes if it detects a collision and adaptive cruise control, features bundled in a $1,300 package on XLT and higher trims. That active safety gear is standard on many of the Explorer’s rivals and it requires first adding a $2,300 option package on the Explorer XLT. It's still no substitute for the automatic emergency braking systems that we think should be mandatory on family-oriented vehicles. In the IIHS’ testing, the Explorer earned “Good” marks in most tests—except in the challenging frontal small-overlap evaluation. There, the driver side earned “Marginal” and the passenger side scored a concerning “Poor” rating. Also, the IIHS called out the Explorer’s collision-avoidance tech, rating it just “Basic” because it does not apply the brakes automatically. The 2019 Ford Explorer can be properly luxurious—for a hefty price. The base Explorer trim comes with a power driver’s seat, alloy wheels, cloth upholstery, and a tiny 4.2-inch infotainment screen. We say skip it and jump to the Explorer XLT, which doesn’t add much more to start with but can be fitted with an excellent 8.0-inch touchscreen for infotainment with Apple CarPlay and Android Auto Capability, plus a built-in Waze app. While you’re at it, an extra $1,300 for collision warnings and adaptive cruise control is worth the money. At this point, the Explorer XLT costs about $39,000 (or $41,000 with all-wheel drive). The 2.3-liter turbo-4 costs $900 and leather seats add another $1,800. Suddenly the Explorer we’d buy is $43,000 and its spec sheet is light on features against the Honda Pilot and Subaru Ascent, among others. At least the Explorer is often discounted. Topping the lineup, the Explorer Platinum does its best to imitate a luxury SUV with its soft leather, power-folding third row, and Sony audio system. But it’s also nearly $55,000. Opt for the turbo-4 and the 2019 Ford Explorer isn’t too thirsty. The 2019 Ford Explorer’s standard V-6 and optional twin-turbo V-6 engines may have you in a first-name basis with the Shell station down the street. Stick with the available turbo-4, however, and the Explorer is more miserly than its hefty size would otherwise suggest. The EPA rates this combo at 16 mpg city, 2 highway, 19 combined—figures that climb to 17/24/20 mpg with front-wheel drive. 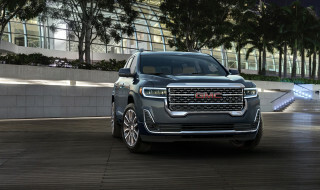 The 2.3-liter turbo-4 available on XLT and Limited trims comes in at an impressive 19/27/22 mpg rating with front-wheel drive and 18/25/21 mpg with all-wheel drive. You’ll have more fun behind the wheel of the Explorer Sport and Platinum trims with their twin-turbo V-6 and you’ll also keep the fuel gauge busier. Those models come in at just 16/22/18 mpg.